Zadig is the story of another optimist—young, rich, beautiful, and engaged to a woman he loves. When his early hopes and assets are destroyed, he embarks on a journey that will systematically explore science, religion, and the military, contributing to each, betrayed by all. Through these trials, he will eventually win the kingdom of Babylon. Public Domain (P)2011 Blackstone Audio, Inc.
Clive Chafer interprets the satire, humor and wit of Voltaire beautifully. This was a delightful listen! 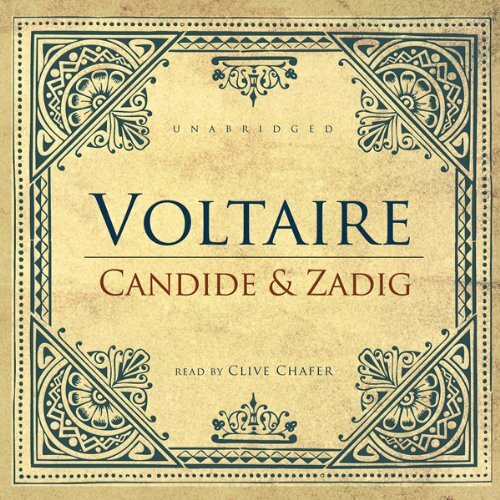 What disappointed you about Candide and Zadig? Who might you have cast as narrator instead of Clive Chafer?